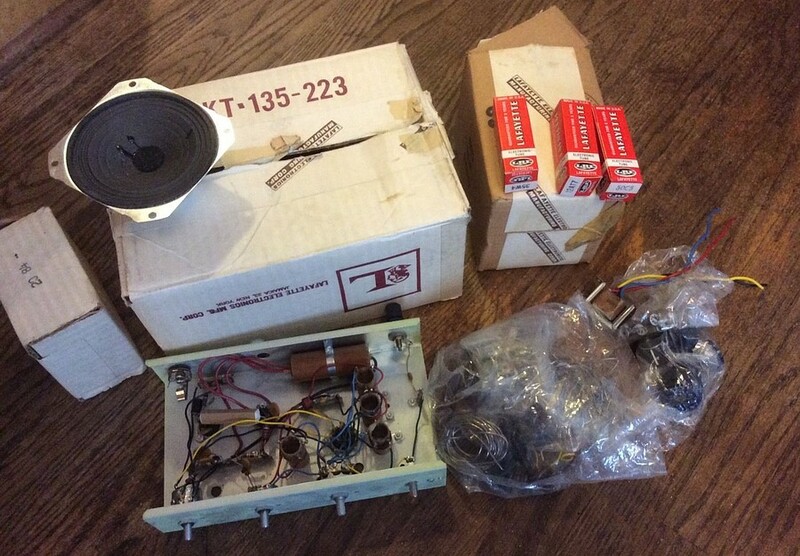 In March of 2016 this partially assembled kit went up on ebay. 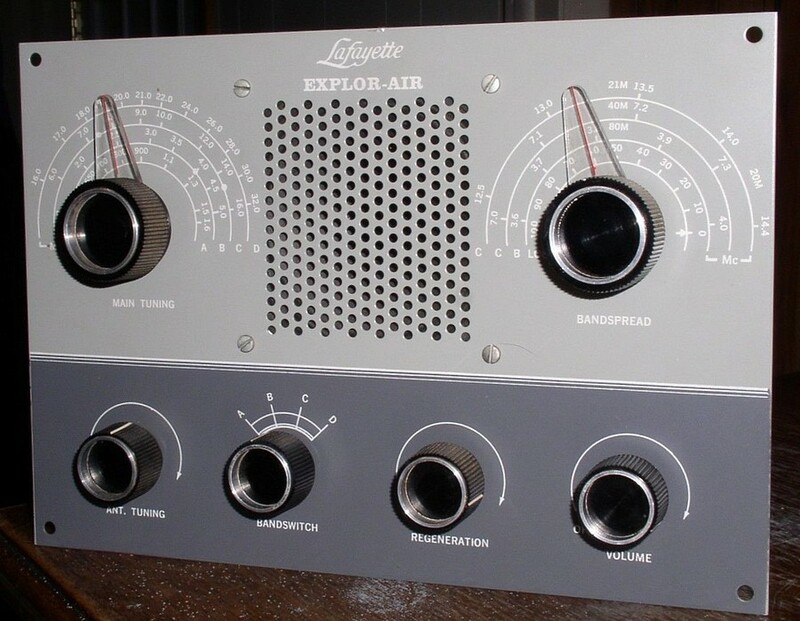 It's a 1965 version with the newer style knobs. The tubes are Lafayette. 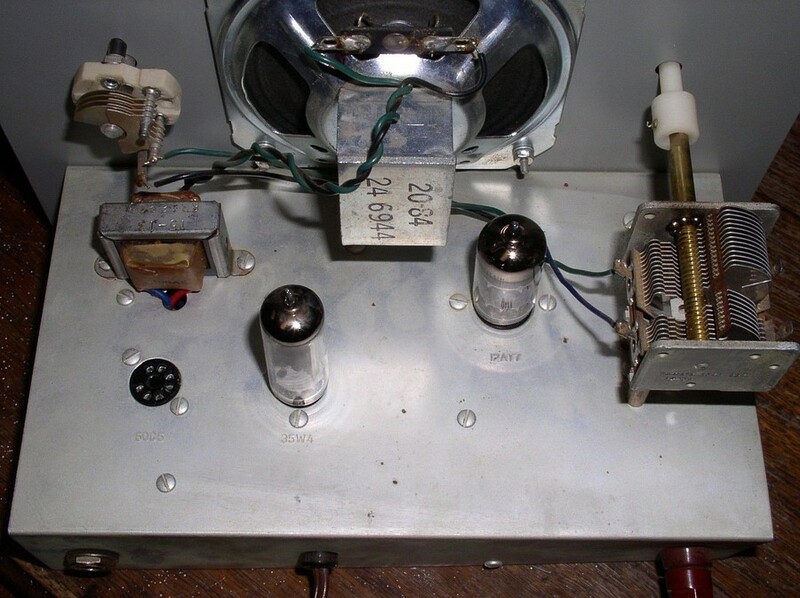 Whoever started this didn't mount the audio transformer or front panel. 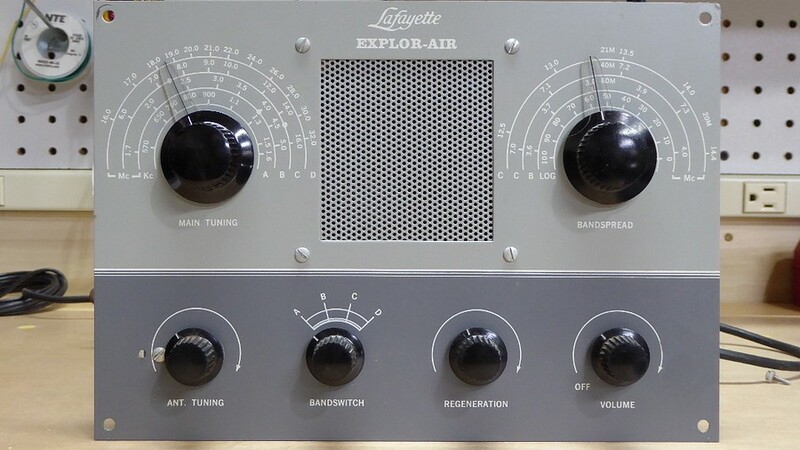 Lucky buy for the winner of this auction, the front panel is in pristine condition. He also got the boxes and all that paperwork. 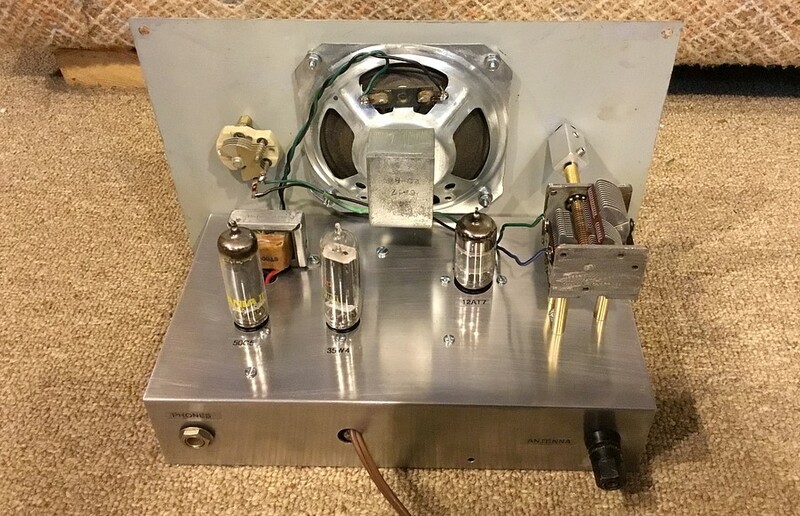 This fine example is owned by Bill Shanahan, who won TWO ebay auctions. 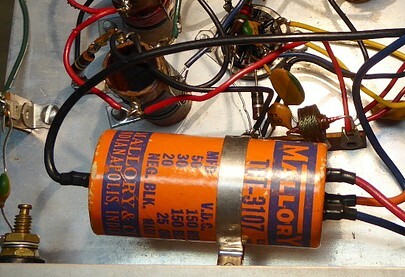 This is a picture of the steps Bill took to recreate the original 10 MFD capacitor. Not satisfied to just "recap" his kits, he wanted them to look original. 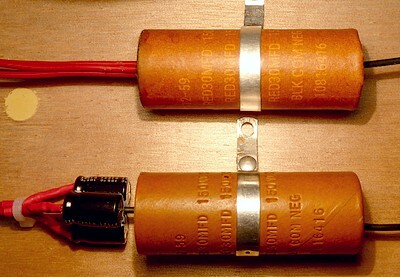 On the left is a Mallory replacement filter capacitor. That's gotta go. On the right-hand photo, the bottom is an original KT-135 filter cap about to be re-stuffed. Above it is a recreation made from scratch to replace the Mallory. Here is the other KT-135 Bill has. The upper knobs are in amazing condition, as is the front panel. I'm a little suspect of the two middle lower knobs, they don't look quite right. 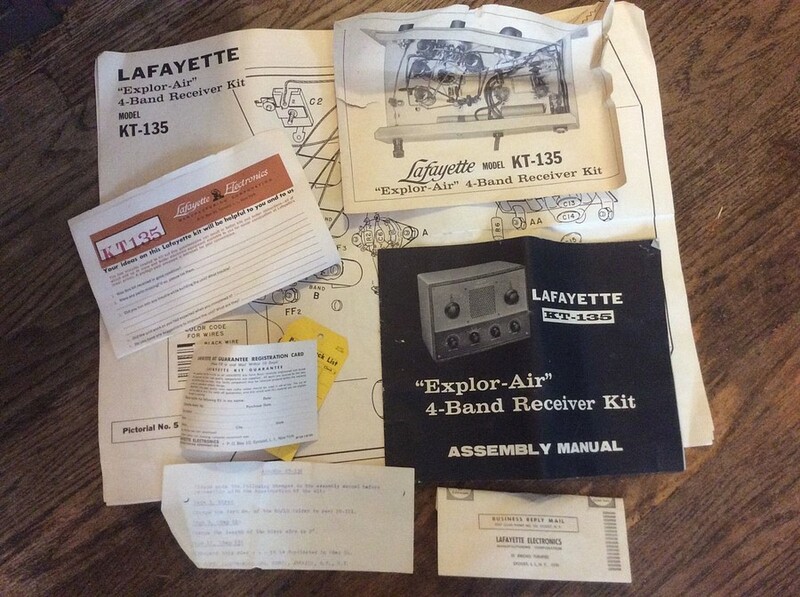 Now Bill will see this and spend the rest of his life trying to track down two original Lafayette knobs. Such is the nature of things. 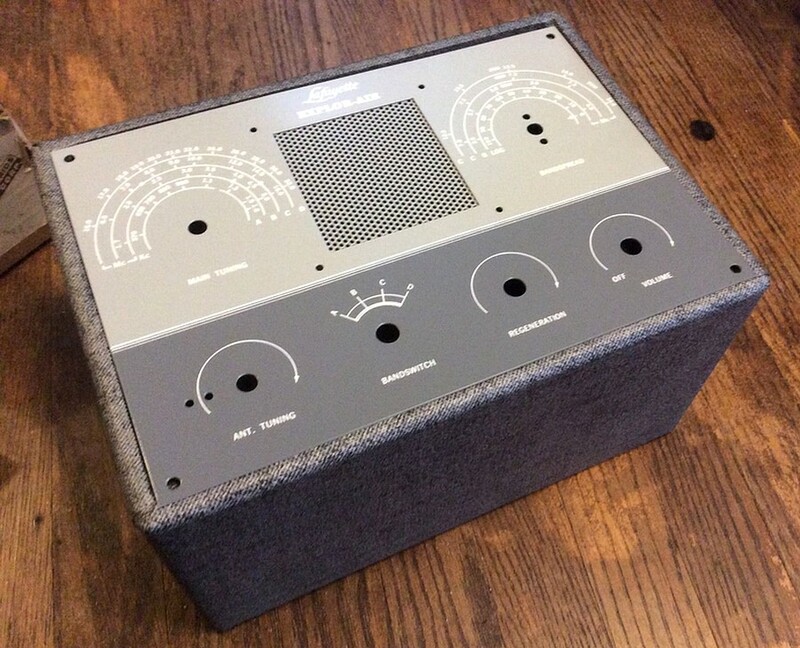 Here's Joe Galicic's radio, purchased on ebay in May of 2017. Here it is after he restored it. What a transformation! He did a transplant. 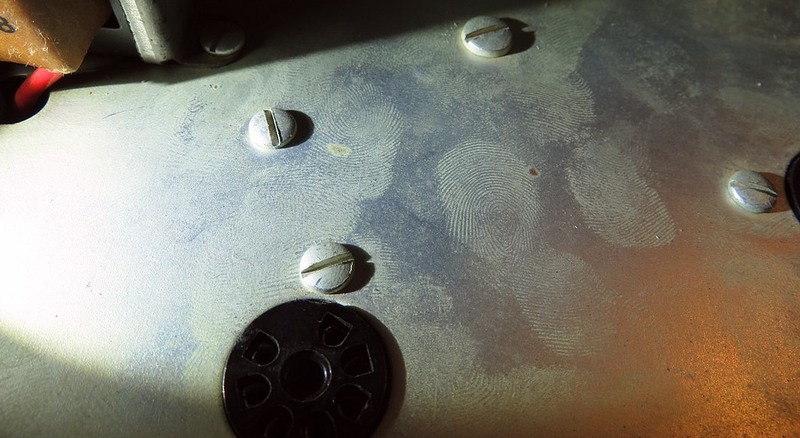 He removed all the components en-mass and then re-installed them into the restored chassis. Look at this, it is as though you have X-Ray vision and are looking down upon the chassis, but the chassis isn't there. 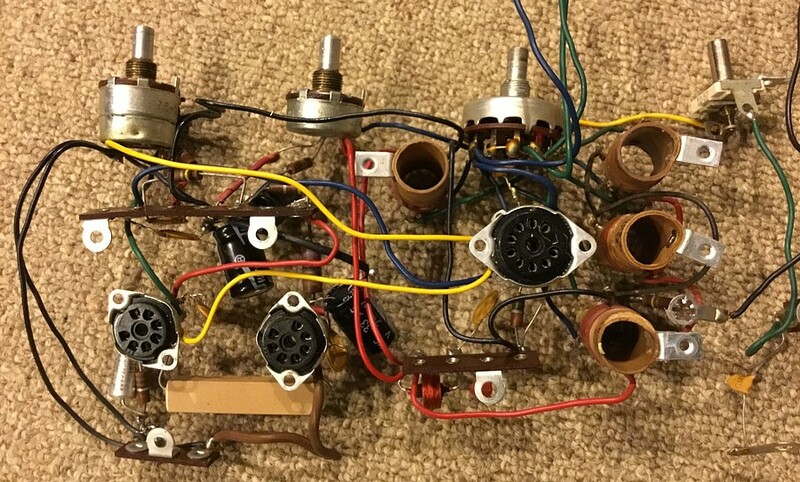 This 1969 model went up on ebay in February of 2018. 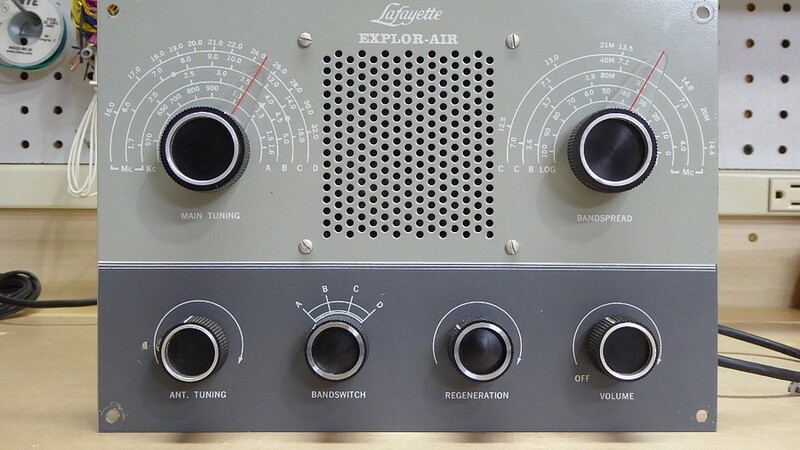 The front panel and knobs are in excellent condition. Not a mark on the front panel. The underside looks new. Nicely soldered, too. The best I've ever seen! Ebay sellers can be funny. This one claimed the 50C5 vacuum tube was missing, so he couldn't test it. My feeling is that the tube isn't missing. 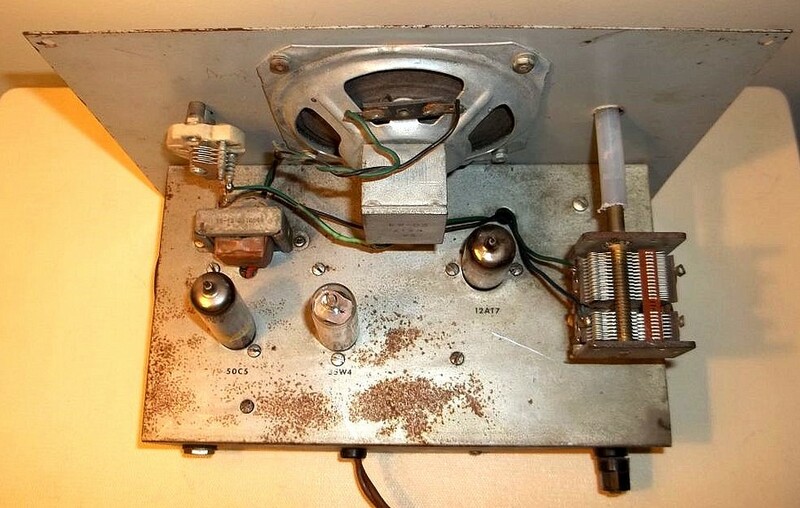 When he turned it on, it hummed loudly because the filter capacitor had dried out after 49 years. At that point he removed the tube and then claimed he couldn't test it. At least he didn't cut the cord off to pretend he couldn't test it, like other sellers do. I could be wrong but it makes a nice conspiracy theory. 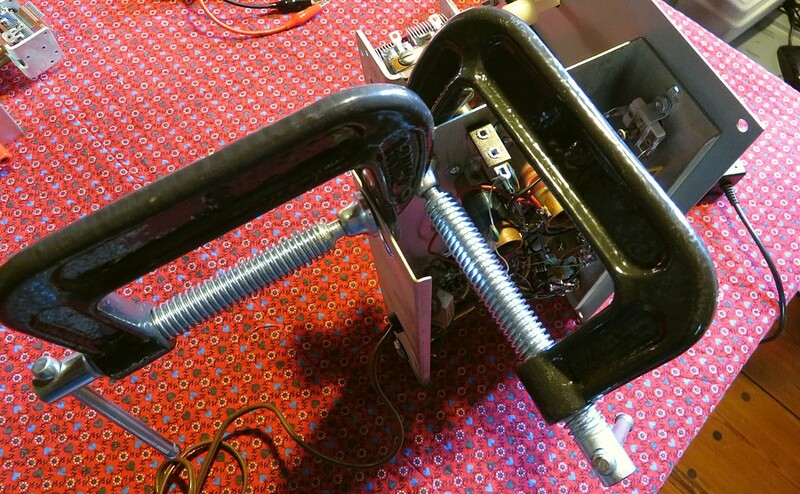 The back of the chassis is bent inward on the right, where it had been dropped onto the antenna connector. It sold for $255.00 on March 3, 2018. According to the high bidder, named Doctor Potter, the radio hummed extremely loudly! He had the same theory about the missing tube. 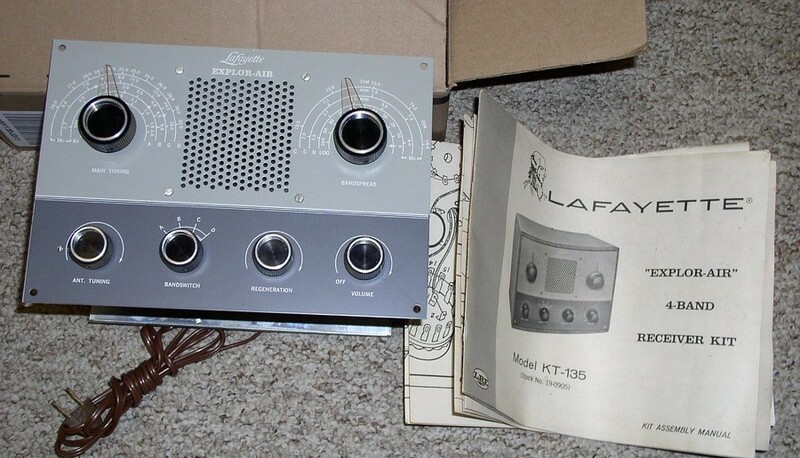 The neat thing about this radio is the builder's fingerprints reacted with the plating on the chassis, and are there forever. They are not "adult size." Dr. Potter sent this to me to repair and I found these prints. They won't wipe off. Straightening the bent chassis. Two small pulls on the left C-clamp was all it took. Next, a rogues gallery of more kits found on ebay.